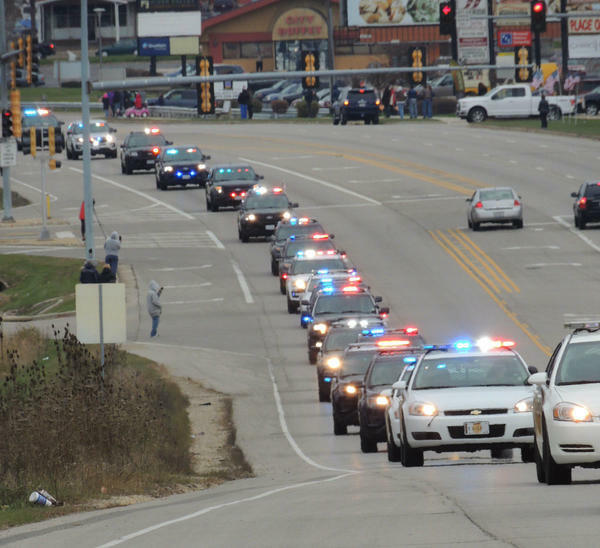 A long line of police vehicles accompanies the body of fallen Rockford Police Officer Jaimie Cox on his traditional "final tour" Saturday. Cars from many jurisdictions took part in the traditional "last tour" through Rockford following Saturday's funeral for Officer Jaimie Cox. 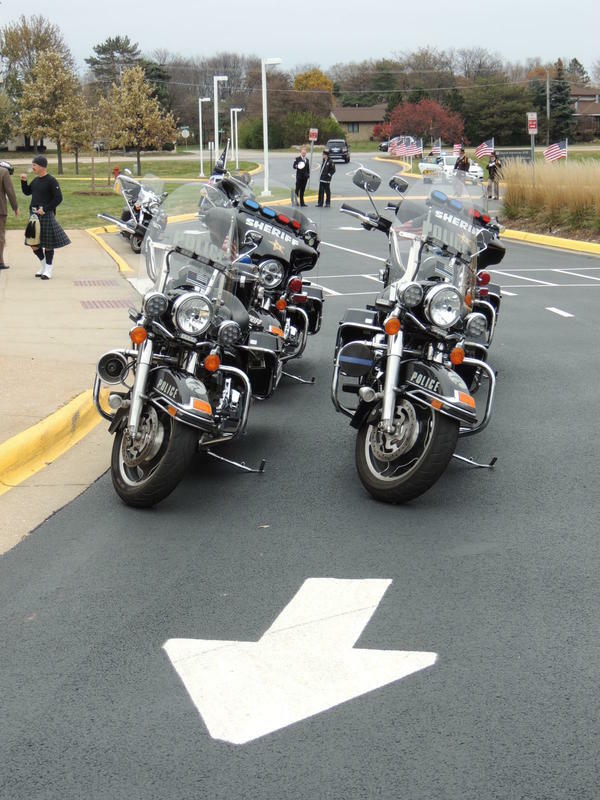 Police motorcycles are at te ready outside First Free Evangelical Church for Rockford Police Officer Jaimie Cox's funeral Saturday. American flags flutter around the First Free Evangelical Church Frounds to honor fallen Rockford Police Officer Jaimie Cox, who also served in the Middle East with the National Guard. 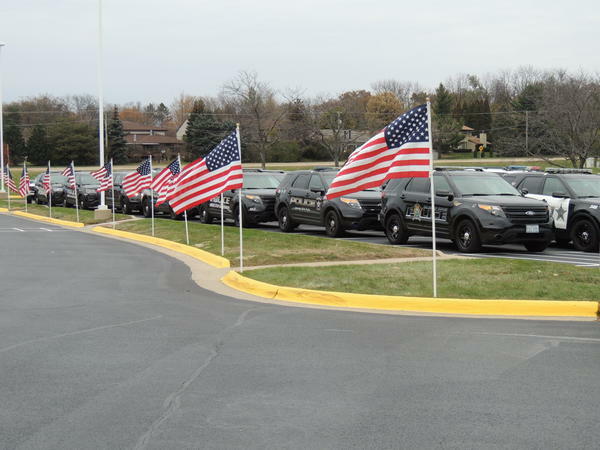 Law enforcement officers from many jurisdictions arrive Saturday for the funeral of fallen Rockford Police Officer Jaimie Cox. Police vehicles are staged and ready for the "last tour" procession that followed the funeral for Officer Jaimie Cox. 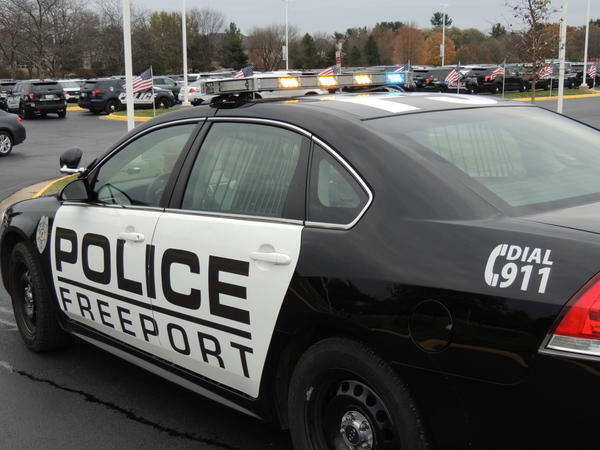 The Freeport Police Department was among many across northern Illinois taking part in honoring fallen Rockford Officer Jaimie Cox. 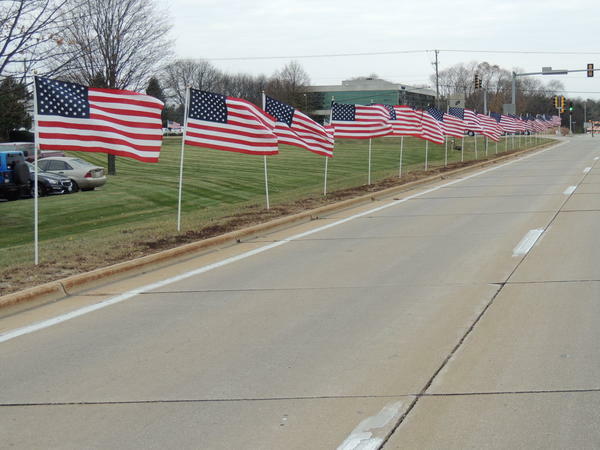 Flags line the drives at First Free Church for the visitation for Rockford Police Officer Jaimie Cox. 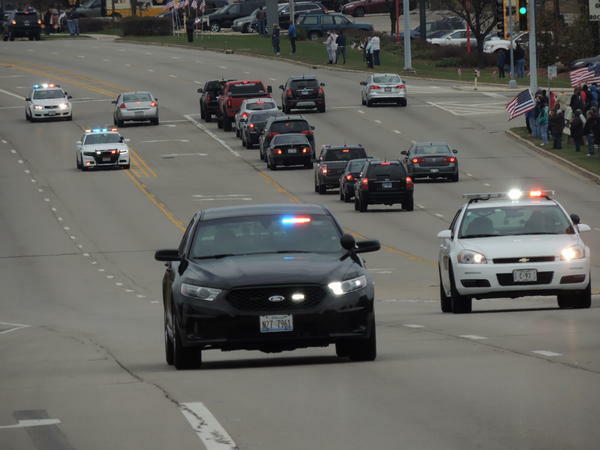 The city of Rockford and others are saying their final farewells to 30-year-old Rockford Police Officer Jaimie Cox this weekend. A police funeral was held Saturday morning at First Free Rockford. Officers from Rockford, northern Illinois, and several bordering states attended. 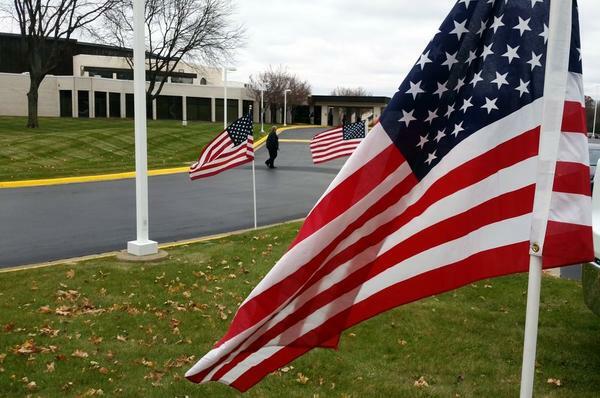 Visitation for Cox, who was killed early Sunday following a traffic stop on the city’s east side, was held Friday at First Free Rockford. A long line of mourners began in the lobby near the door, winding around to the front of the church where Jaimie Cox’s body lay in an American flag-draped casket. A uniformed honor guard of four officers stood above the coffin as mourners slowly passed by. In the lobby of the church, officers from numerous jurisdictions waited and talked quietly among themselves. 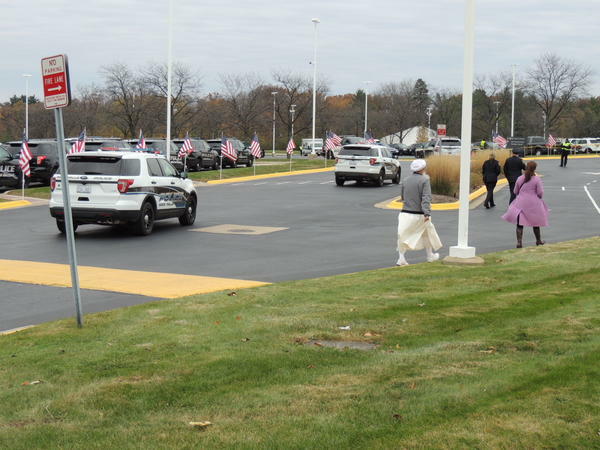 Uniformed mourners included rank-and-file police and their commanding officers from departments all across northern Illinois, with representatives from other states as well. State troopers, sheriffs' deputies, fire departments, medical flight crews -- even police Explorer posts -- also came to pay their respects. The military also was well represented, with enlisted ranks, non-commissioned officers and officers decked out in dress uniforms. Cox was a veteran of the Illinois National Guard and served a deployment in the middle east. Veterans groups also took part in the visitation, posting honor guards and opening doors for all the visitors. Illinois Gov. Bruce Rauner was among the visitors, and he paused to greet the veterans as he entered the church. Cox reportedly died as the result of blunt force trauma injuries believed to be caused when a pickup truck driven by 49-year-old Eddie Patterson slammed into a tree on the property of the Unitarian Universalist Church early Sunday morning. Patterson died as the result of gunshot wounds apparently fired by Cox, and his body suffered injuries from the vehicle crash as well. Funeral services for Patterson were scheduled for Saturday afternoon at Kingdom Authority Church.